Imagine the following scenario: You’re spending the day exploring San Francisco, and before going to lunch, you park your car on a slanted city street. You’re walking toward your favorite bistro, stomach growling, and suddenly, you hear screams coming from behind you. You turn to see your beloved car, rolling down the hill toward a busy intersection. Hopefully, this terrifying scenario will never happen to you. An out-of-control vehicle is essentially a deadly weapon, and if your car were to roll and kill someone, you would be held responsible. This isn’t likely to happen as long as you always remember to engage the parking break. However, learning a few important rules about how to park on a hill is certainly a good idea. Pull into the parking spot and hit the brakes, leaving your car in drive. If you have a manual transmission, leave the car in first gear. If you are parked on a road with a curb, turn the steering wheel in a counterclockwise direction, making the wheels face outward toward the road. If there is no curb, face the wheels in the opposite direction. Put the car in park, set the parking brake and shut off the engine. It’s good idea to always get into the habit of using the brake, even if you aren’t parked in a hilly area. Pull into the parking and hit the brakes. If you have an automatic transmission, leave the car in drive. If you have a manual, put the car in reverse. For downhill parking, turn the steering wheel clockwise, making the wheels face inward. Do this even if the road doesn’t have a curb. If you have an automatic transmission, put the car in park, shut off the engine and set the parking brake. If you have a manual, leave the car in reverse. This will help ensure that the car remains in place if the parking brake were to fail. Unfortunately, if a vehicle begins rolling out of control, it often can’t be stopped until it hits something that stops it. Hopefully, this will just be the side of a building or the back of another car and not an innocent pedestrian. If your car is rolling very slowly, you may be able to open the door, hop in and hit the brakes. If it’s already rolling fast, attempting to stop it yourself could prove deadly. Don’t try to be a hero in this scenario. Sometimes, it’s better to let fate play out than to make things worse by risking your own life. It would be a shame if you were to be killed trying to stop a car that was simply going to roll a few more yards and then crash into a dumpster. If you see the car rolling toward pedestrians, you will probably be more successful shouting out a warning versus physically attempting to intervene. If this article is making you nervous, don’t worry. 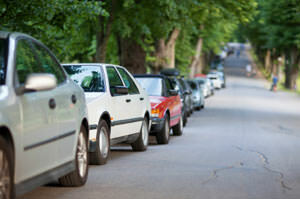 Parking brakes rarely fail, and even if they do, a parked vehicle will not often begin rolling on its own. However, because the consequences could be so deadly, it’s important to commit to taking every possible measure to prevent this from happening.